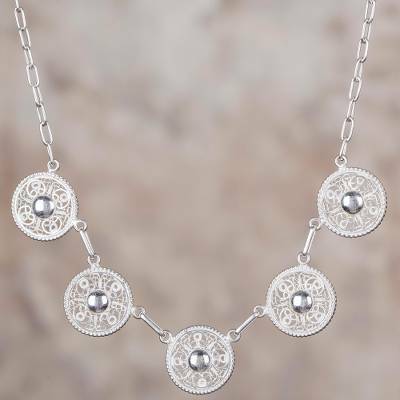 Sterling Silver Filigree Circular Pendant Necklace from Peru, "Sparkling Full Moons"
Five sparkling full moons are handcrafted with sterling silver filigree work for a linked pendant that brings elegance to the wearer. Enjoying the delicate, diligent nature of his work, Peruvian artisan Alfredo Inga designs this necklace, centering the half-moons on a length of sterling cable chain. This is a very well made and pretty necklace. Because, of my arthritic fingers I'm going to have to change the closure to something that is easier for me to operate probably some sort of magnetic closure is going to work best for me. Love this necklace. I wear a lot of silver and don't mind mixing my metals so I could pair with some other color also.